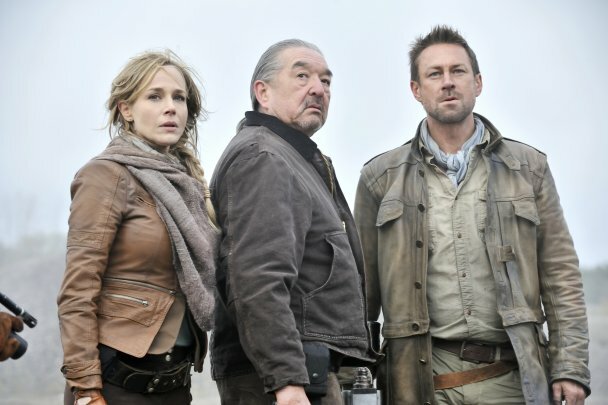 Syfy recently premiered its new sci-fi epic series Defiance, a complex, baffling TV show about aliens and humans trying to get along in a ruined Earth. It’s a bit too complex and not for casual viewers, but it has some potential. Much of the background for Defiance is never explained onscreen. In fact, I had to go online to its official website to learn it, which helped explain a lot of the show’s lore. It’s a very detailed but regrettably most of it is never mentioned or shown and doing so would help immerse viewers to this intricately crafted world that the show’s creators went out of their way to assemble. A few years from now, several, huge alien ships arrive on our planet carrying refugees made up of seven different alien races. Together they’re called the Votans, but the show concentrates on two of these races: the Irathient and the Castithan. The Irathient are vaguely cat-like with their bright irises and slightly bulging eyebrows. They’re very spiritual and independent minded with little regard for traditional law. The Castithan are a race of albinos with shocking white hair and skin. They come off as arrogant and disdainful of other races, including humans and try to preserve their caste-based culture. The Votans were seeking a new world after their solar system was destroyed. This, of course, led to conflict with the humanity. After a brutal war, both sides reached a ceasefire and chose to share the Earth. One nasty side effect of their arrival is that the world was accidently and partially terraformed, leaving most major cities and landscapes destroyed or unrecognizable. Bizarre, hybrid plant and animal life emerged and mass social and political upheaval threw the world into chaos. The survivors now struggle to make it through the day, while trying to at least tolerate each other. Defiance takes place in what was once St. Louis, Missouri. 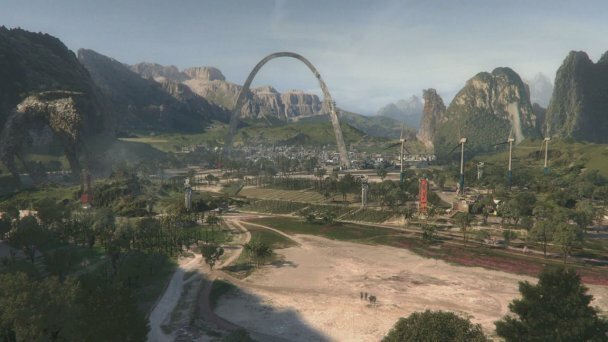 The ruins were resettled by a mix of humans and Votan races and renamed Defiance. It’s essentially a crowded Wild West backwater town mixed with elements of Farscape, Firefly and The Road Warrior. 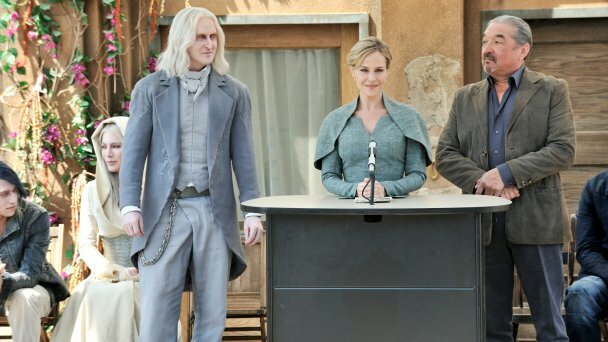 Despite a crowded lineup of characters, Defiance revolves around five characters, with three of them taking center stage. Running the place is the new mayor Amanda Rosewater (Julie Benz), who tries to keep things running smoothly and getting all the human and alien factions in town from killing each other. She’s insecure about her position and is trying to earn the townspeople’s respect; at the same time Rosewater has to face the harsh reality of backdoor deals and maintaining composure. 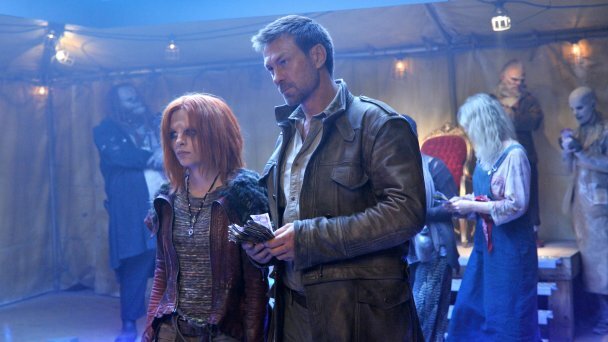 At the end of the pilot episode she hired a drifter, Joshua Nolan (Grant Bowler), as the sheriff or rather lawkeeper of Defiance. Nolan is your typical Han Solo/Malcolm Reynolds type, who looks like Christian Slater’s older brother. He’s a cynical war veteran first seen roaming the countryside with his Irathient adopted daughter Irisa (Stephanie Leonidas). After passing through Defiance, Nolan went against his bitter nature and decided to stay in town and bumble his way through many dull police cases. His daughter Irisa, who was a war orphan rescued by him, can’t understand why he wants to plant roots in the town and wants to reach Antarctica, a supposed paradise on par with Tahiti. She is exotically pretty and a hothead with a troubled past. The other two prominent characters are Datak Tarr (Tony Curran) and Rafe McCawley (Graham Greene). Tarr is a nefarious Castithan businessman who runs the town’s underworld. His ambition for political power is surpassed by his cunning wife Stahma (Jaime Murray), who gives Lady Macbeth a run for her money. McCawley is a rival businessman that owns a nearby mine and can’t stand Castithans, namely Tarr. Episodes deal with Nolan trying to keep the peace, while Tarr and McCawley vie with each other and Rosewater. Some of the bland drama comes straight from routine Western dramas. Tarr and McCawley feud, while their children are romantically involved with each other; Nolan has a fling with the town prostitute (Mia Kirshner), who happens to be the mayor’s sister; one episode even borrowed heavily from Stagecoach. On the whole, Defiance has a richly detailed world with an exhaustive backstory, and tries to emulate Firefly or Farscape but it cannot. While the trappings are eye catching, the show’s stock characters and predictable stories hamper it. That is surprising considering that the show’s creators are Rockne S. O’Bannon (Farscape), Michael Taylor (Battlestar Galactica) and Kevin Murphy (Reaper, Caprica), who all created, produced or wrote some terrific genre shows. Still, while Defiance isn’t captivating it does have a slow burn quality to it and seems to be carefully building up its storylines. Some stories and developments did hold my attention. It should toss out the uninteresting cop procedural stuff, or go into more detail about the world of Defiance and not leave it up to viewers to track it down. Or jettison some of the trappings to make viewers want to learn more about the show. Some TV shows take a while to get its bearings before reaching their potential. Defiance could go either way, hopefully it will find its footing because it’s one of Syfy’s better original offerings of late.